Final Cut Pro X plugin creator, Pixel Film Studios, announces the release of ProBook Pop-Up. This Plugin is perfect for all types of media. ProBook Pop-Up is a set of self animating generators created for use in Final Cut Pro X. With ProBook Pop-Up editors can create fantastic 3-D scenes without the use of keyframes. Showcase the scene with an intuitive 2-point camera system that allow users to chose a start and end point. Customize everything from the colors of each page to the shadows of personal pictures and video files. ProBook Pop-Up features four intuitive generators with self turning animations. Flip from cover to scene or from scene to scene without having to set a single keyframe. Simply insert personal media into the dropzones, set the camera movement, and allow ProBook Pop-Up to do the rest. 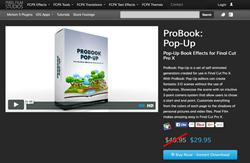 ProBook Pop-Up features generators with up to 20 drop zones. Freely scale and position drop zones to properly orient the media. Insert any media with transparency such as .png or alpha video flies to create a scene with incredible parallax. Design anything from magical cartoon forests to fun filled family albums. Probook Pop-Up is completely customizable in Final Cut Pro X. Easily change the color of the vignette, environment, and pages with intuitive color wheels. Customize the intensity of shadow and reflections with simplistic sliders. Darken the shadows create a moodier scene or brighten the scene by boosting environment reflections. The options are endless with ProBook Pop-Up. Create any 2-point camera movement with simple controls that can be found in the inspector window. First, drag the playhead to the first frame of the ProBook generator and determine the start orientation of the camera. Next, move the playhead to the last frame of the ProBook generator. Lastly, set the end orientation of the camera, and watch the scene come to life. Established in 2006, Aliso Viejo, California-based Pixel Film Studios is an innovative developer of visual effects tools for the post-production and broadcast community. Their products are integrated with popular non-linear editing and compositing products from Apple FCPX. Apple, the Apple logo, Mac OS X, and Macintosh are registered trademarks of Apple Inc. in the U.S. and/or other countries. All other trademarks and trade names are the property of their respective owners.